"Why don’t you put this up on divinetaste?" asked my very enthusiastic mother as she stirred a batch of coconut and jaggery mixture from the coconuts used in the rituals of my son’s naming ceremony. I have been on the look out for a good coconut burfi recipe. I was not at all satisfied with a couple of recipes I had tried before. I was a bit skeptical about it when I learned that “amma” had used jaggery instead of white sugar. Coconut burfi is traditionally made with refined white sugar. The creamy whiteness of the grated coconut coupled with the white sugar is quite a pleasing sight apart from being a tasty treat. I’m a huge fan of jaggery and would happily replace it with refined white sugar wherever possible. Rich in nutrients and with a wholesome taste, it holds an esteemed position in my books. But I find that jaggery cannot make the cut in certain recipes. Luckily for me, it does great wonders here and my search for a good coconut burfi recipe is over. I’m biting into a piece, as I write this and besides being a healthier version of the traditional version, I love the sweetness coming from the jaggery instead of from regular sugar. 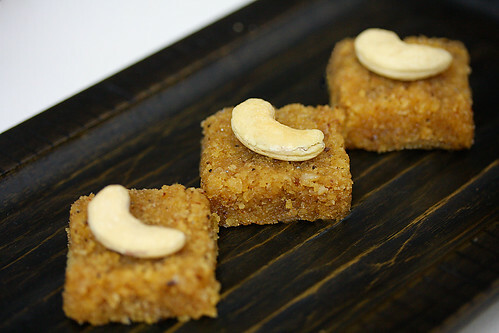 Using just two ingredients, coconut and jaggery it makes a nutritious and tasty treat. You can shape the coconut mixture into balls to make laddus or cut them into diamonds to make a different shaped barfi. Place the grated coconut in a blender or food processor and process until finely ground. In a medium sized wok or kadhai, place the coconut and jaggery mixture on a medium low flame and cook until the entire mixture comes together or starts to leave the sides of the utensil, about 15 to 20 minutes. Stir in the cardamom powder. Spread on a plate and cut into squares. Decorate with cashewnuts or any other nut of your choice. Wow just two ingredients? barfi looks delicious! Wow….coconut burfi is my favourite….never tried with jaggery…..looks yum…. The burfis look perfectly shaped and lovely golden color. Red chillies: My mother adds cardamom powder too and I prefer it with it. Adding sesame seeds seems an interesting variation. Will try it next time I make this. Arundati: Nice to have you over too. In bengal, jaggery & white sugar, both are used, but my favorite is the one with gur. & yes we do add the cardamom powder. we are more used to the laddu shape & this is a big time favorite with my & hubby. I am yet to make this at home, feel a little apprehensive that i burn the jaggery. it is time i give this a try instead of waiting to get it transported from india. Such a delicious looking dessert!! And only 2 ingredients! wow!! Hi, Did you use dry or wet coconut? I get both varieties in the store here. (A) Dried unsweetened shredded coconut and (B) Wet sweetened shredded coconut. pintobean: I used freshly grated coconut (not dry). Dont you get fresh unsweetened coconut? You can use dried coconut too, but make sure it is not sweetened already since there is additional sweet in the form of jaggery in this recipe. Since I used jaggery instead of sugar it is not very sticky. Spread the mixture on the plate when it is still hot. Once spread allow to cool, anytime between 15 minutes to half an hour and then cut into pieces. I hope you enjoy making and eating them. Thanks Anushruti, for the prompt reply :). I haven't seen fresh coconut in the store close to me. The unsweetened shredded coconut I get in the store (I have used it for another recipe before) is available in bins here next to nuts, rice, oats etc. I'm sure some stores carry it but I have no idea. Do you recommend using any oil or something? Since the coconut I am using is not wet enough as it is not fresh. Or just jaggery and coconut should be enough. Also, if I decide to use sugar, do I melt the sugar beforehand and then mix it with coconut and cook it? Or cook the sugar and coconut together? pintobean: I havent tested this recipe with dry coconut so I cannot talk about the results with much clarity. Dry coconut when cooked releases oil so there is usually no need to add oil. Recipes that use sugar vary and have both methods i.e melting the sugar before hand and cooking with the coconut. Although sugar tastes great I prefer using jaggery. we have almost similar barfi made at home during diwali..with milk,fresh coconut and sugar..becomes more like a coconut fudge..tastes divine..i'd love to try out your version..i guess it's healthier with jaggery..
devina: If you are used to the sugar version you will be pleasantly surprised to taste the jaggery version, I assure you. I had tried to do this recipe.. but could not the get the burfi hardness i am not able to understand why…! Any idea about calorific values of jaggery? Say one tsp of sugar= x calories, then 1tbsp= how many calories? Kaylon: This is a soft set burfi, not at all hard in consistency. Simi: Sugar has empty calories whereas jaggery is a nutrient rich natural sweetener. Jaggery is a wholesome unrefined sugar rich in iron, magnesium and potassium. Jaggery contains 28 grams per kilo of mineral salts, while only 300 milligrams per kilogram is found in refined sugar. More information on Jaggery here and here. I too love the coconut burfi traditionally made with sugar. But I would certainly love to make them with jaggery as m also a huge fan of both coconut and jaggery. They look delicious. I would be trying them ASAP. We are currently posted at korykond in AP, and have abundant coconut and mago trees around. So I have to try making these burfis. One very good thing about your recipes is they give they have precise and clear measurements in gms, lts etc which leaves no chance for anyone getting the recipe wrong in anyways. Cheers for this. Do we need to take off the black thick skin of fresh coconut and use only the white part ? or do we grind the whole coconut instead ? looks very yummy! will try this dish this weekend! I made the recipe but it did not come as perfect squares. I followed the exact recipe, i allowed it to cool for 30 min, then i cut but it was not as dry and perfectly shaped as yours, what would have gone wrong? I stirred the mixture till it came as one full mass. I tried these burfis today. They turned out to be delicious, but do not seem to hold shape-did I undercook them? Thanks. rkc: These are soft set burfis and if you are looking for that hardness which comes with burfis made with white sugar then you wont find it here. Hi canons use dry coconut instead the wet coconut? ruchika: Will surely keep your request in mind. I post 3 to 4 recipes every month. Used to post more but now its a little difficult but I try to do a minimum of 4 posts most of the time. 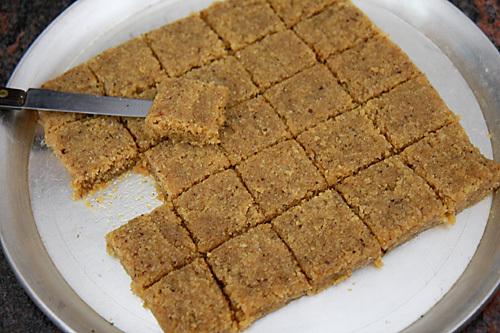 Which jaggery do you recommend for this burfi? I prefer the dark coloured palm jaggery, but I only have the lighter yellow one at hand right now. Would it come right with the yellow jaggery? I simly love your blog. I think burfi tastes still good without grinding the coconut. make sure you're prepared for the marketplace. Will grow by 1-2 million skincare over the next 10 to 15 years. London City Locks Ltd is London's most cost effective locksmith. is approaching one hundred and thirty five percent of JDP. Can one use the hand grated coconut? The difference iss that in the blender one you still get the brown skin of the coconut whereas in the hand grated one only the white of the coconut is used. Can you also post some pics of the cooking process. That will give a better idea. Preeti- Hand grated coconut is best. will try and post. Love your website and your recipes. Very refined and elegant. You are too. Is this sweet similar to Poornam? we make it for modakams and Poli stuffing. When I saw this post, I was reminded of the Poornam that we make during Ganesh Chaturthi festival etc. Poornam can't hold its shape unless we roll it in a ball. Since you had cut it in squares, I was wondering. I am like you too, I love jaggery. Coconut and jaggery is my version of heaven. mona- Yes this is similar to modak and kadabu stuffing. Thanks you for your kind words. Can this be made with dessicated coconut purchased from a store…. Radhika- Yes you can. Good luck! Gayatri- Great! Do share pics if you have them. Anjali: Thanks for the feedback. So nice to see that you are taking such good care of your daughter. All the best.